DP Animation Maker features an option that allows you to generate seamless looped animation automatically. This option is available for GIF, PNG, and WMV exports. 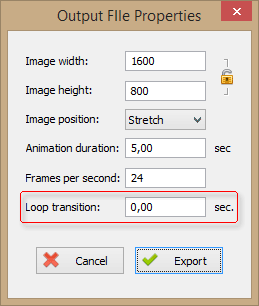 To save looped animation, first start the export process and set to a parameter called "loop transition". This parameter sets the duration of the transition period between the end and the start of the exported animation. Here are a couple of examples showing animations generated with this parameter. Pic 1. Scene with short transition period. Pic 2. Scene with long transition period.